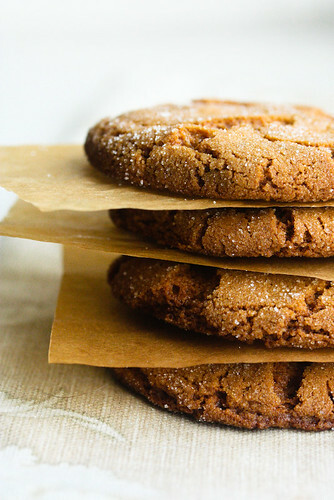 Okay, so, holiday cookies. R and I started on our holiday baking on Sunday, since we wanted to bake 5 different kinds of cookies with enough time to distribute them to our friends before I leave for Colorado for winter break. And in case you're still planning your holiday cookie plate, I wanted to get the results up relatively quickly. So my goal is one cookie post a day for six days. That's kind of an onslaught of cookies, I realize, at a time when you might be all cookied out. But thanks to R's family and friends, I have some pretty unique, and very Norwegian recipes to share, as well as some more typical selections. Let's start with the easiest first. I'll admit that I chose this recipe partly because I happened to have every last ingredient already on-hand (including molasses, thanks to this killer persimmon upside down spice cake). 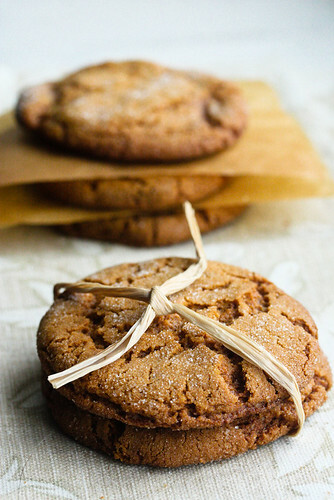 These Molasses Crinkles come from Mollie Katzen's Still Life with Menu Cookbook, and the recipe was given to her mother by a neighbor. I baked these a little longer than Katzen suggests, because I wanted them kind of crispy, but you'd get a softer cookie by baking them for the suggested 12-15 minutes. Mine stayed in closer to 20 minutes, and were firm when they came out of the oven. They continue to crisp as they cool, so be warned. So far they have been universally loved. R called them "sooooo good" where the 'so' is dragged out into multiple syllables. I love that 'so'. Also, he keeps sneaking them. Another good sign. Oven preheated to 350. Either grease two cookie sheets or cover them with parchment paper and set aside. Melt the butter in a bowl in the microwave, then transfer it to the bowl of your mixer, or use a hand mixer. Beat in the molasses and the 1 cup sugar. Next beat in the egg. Set this mixture aside. In a separate bowl, sift together the flour, salt, baking soda and spices. Add the dry mixture into the wet one, and stir until it is well incorporated. Put the extra sugar into a flat dish or shallow bowl. Form the dough into 1.5 inch balls, then roll them in the sugar. Place them on the baking sheets, keeping room between the balls as they will spread with baking. Bake for 12-15 minutes, or up to 20 minutes for crispier cookies, adjusting for the particularities of your own oven. Cool on a rack and enjoy. UPDATE: After having these cookies hanging around for a few days, I've realized that 20 minutes is too long of a bake time. While still delicious, they went from crispy to incredibly hard. So take them out closer to 12-15 minutes, before they've completely set. As I said, they'll get crunchier as they cool. Those cookies are gorgeous. Definitely going on the winter baking list! Thank you for posting this recipe! I was wanting to make molasses cookies and have a new bottle of blackstrap molasses...thought I would have to buy another type of molasses to make cookies with. My favorite cookies.